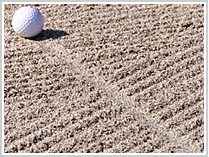 The main reason why Aomori sand is used at so many golf courses is the consistent round shape and grain size. These characteristics prevent the sand from being compacted, while achieving good water drainage, making it the optimal sand for greens. Aomori sand with such perfect properties is an artwork of Nature. Luna Sand, our own brand of Aomori sand, is renowned for its high quality and compliance with USGA standards in regard to granularity and other specifications. Many detailed quality analyses of Luna Sand have been made. If you are considering enhancing or topdressing greens, please feel free to contact us. Our knowledgeable staff will explain our products in detail. ※2 Not more than 5% silt, not more than 3% clay, and not more than 10% very fine sand together with the preceding two kinds of soil.